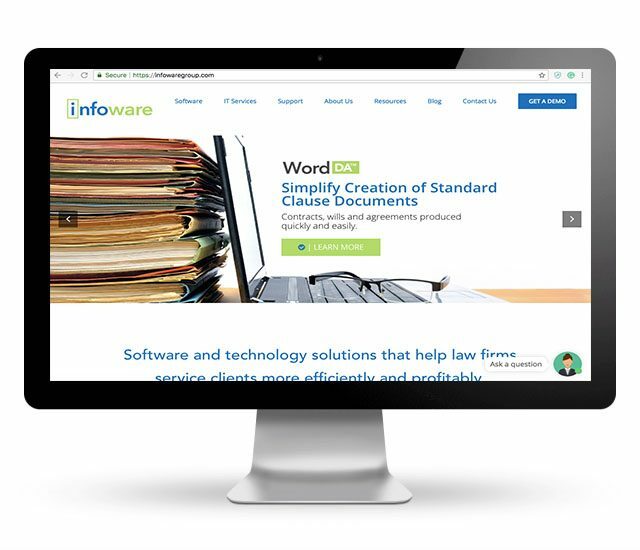 Infoware Group A software and technology services firm established in 1986, simplifies document production for the legal industry with its innovative suite of document automation solutions. Their mission is to build long-lasting and trustworthy relationships with their customers while delivering exceptional software products, and IT services. Infoware’s software solutions help lawyers and law firms build better legal documents faster. Pedestal was excited to help this forward-thinking B2B SaaS firm generate more qualified leads. Pedestal began by designing a plan to help Infoware Group reach its goals. The approach combined search engine optimization (SEO), targeted pay-per-click advertising, data analysis, and strategic web development. Through this process, Pedestal helped consolidate Infoware Group’s web assets into a single website and optimized the website’s homepage, driving more traffic, increasing lead engagement and improving the user experience. Ongoing SEO auditing, analytics reporting, keyword research, content optimization, technical SEO, and targeted paid media purchases are continuing to combine to make Infoware’s site more visible on relevant searches.